Our canvas wall displays are designed keeping in mind that they fit every space with perfection. We have a range of options for you to choose. Whether it’s a small space on your wall or the entire wall together, we help you cover it all with beautiful photo canvas prints. You can also share your wall decoration theme, to help us guide with customisation options. We have 10 designs for you to choose and match your theme. Our team of experienced designers is always there to help you edit and arrange pictures. This is a Google trusted store, you can feel safe with your data and personal information. 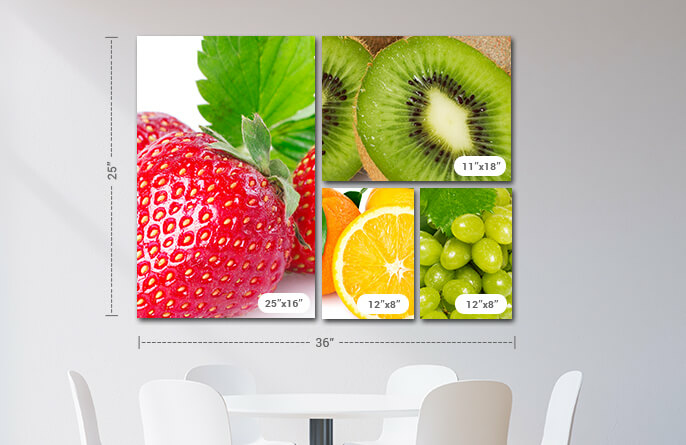 We aim at printing best quality canvas wall displays to make your walls look gorgeous. Through our attempt to offer canvas wall displays at reasonable prices, we aim to deliver best quality canvas prints to every home. We understand and value the love you have for your home/office space. To help you fill them with lovely canvas wall displays, we have hired a team of highly experienced artisans. They not only mould beautiful custom canvas wall displays for you but also guide you to have a better artifact. Single canvas prints can be a good option to fill up small empty places, but if you really want to display a beautiful moment or your best-clicked picture through canvas prints, Canvas wall displays are your best option. They help you display the photographs with perfection, giving a perfect view from every corner of the room. 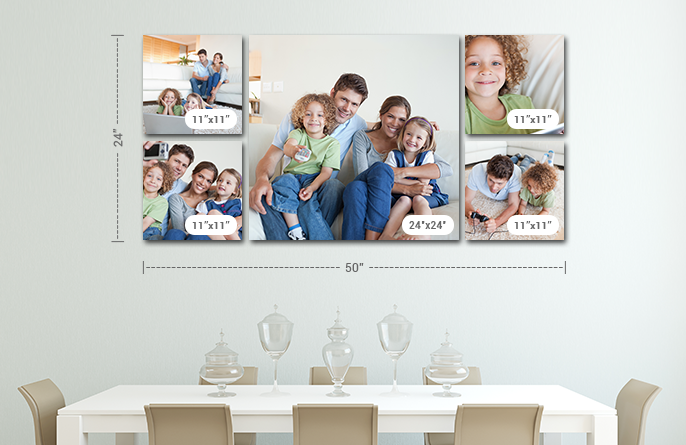 So, if you want to display your photographs larger and lively, canvas wall displays could be your best choice. It isn’t just a single canvas wall display we do, you can get multiple wall canvas display to narrate a story. Want to dedicate a wall to particular subject/relation/theme? We have it for you. Choose our range of customisable canvas wall displays and let your wall match your dream standards. And yes, we do suggest you consult our experts once before you submit your order. The conversation might help you in making better decisions. Q: What is the difference between "mirror image wrap" and "gallery wrap"? Also, before I start my order, do you deliver to the Isle of Man?Thank you. A: Dear Diane, Greetings! Thanks for getting in touch with us and for choosing Canvaschamp. 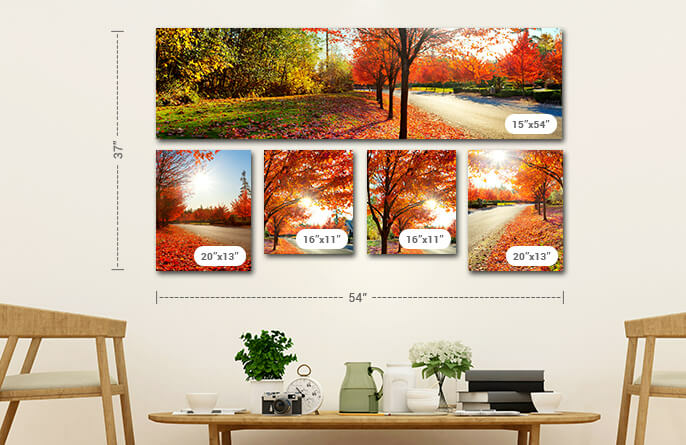 Gallery wrap canvas means they come with pre- stretched canvas on 0.75" thin wooden frames or 1.5" thick wooden frames.They come ready to hang. 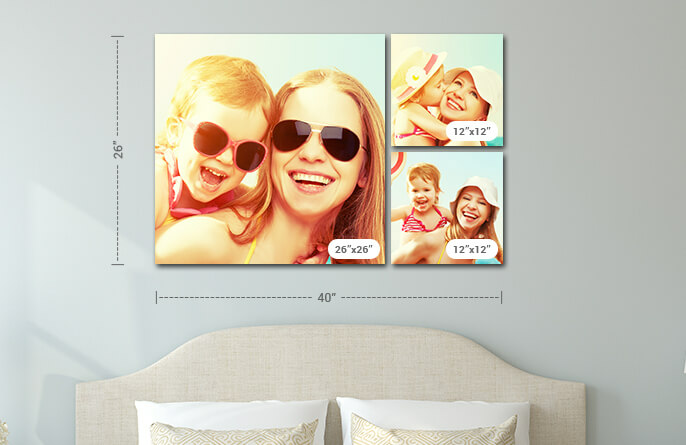 MIrror image wrap means the canvas print will have mirror borders, wrap the parts of the image closest to the edge over the sides of the canvas in a mirror image. we can do the delivery to the isle of man. Please let us know if we can help you further. Kind Regards, Sam, Canvas Champ. Q: Are you able to take one image and split it into 5 panels of the following sizes: 1 - 12x242 - 12x202 - 12x16If so, how much would this cost?Thank you. A: Hello, Thank you so much for reaching out. We can definitely split an image and make a 5 panel canvas print/metal print/ acrylic print/ canvas banner/ photo board. Kindly send us the details and the picture that you would like to use and our design experts will have a look and let you know if it is perfect for the sizes you intend to do. Also they will be providing you a proof and a quotation for the same. You can email us the details and further queries at cs@canvaschamp.co.uk. Q: The subject's head is close to the top of the image. Will the top of the head be cut off in the wrap? How many inches are needed for wrapping? A: If the head is close to the top then you should opt for a mirror wrap which will show the entire image in the front and hence nothing would be cropped or get lost in the wrap. The thickness of the wooden frame is either 0.75 inches or 1.5 inches. So you must consider this only when you are looking for a gallery wrap. The thickness would not matter in case of a mirror wrap. A: You can have any of the two options for the edges when you go for a canvas wall display, it can be mirror image wrap or a gallery wrap (image wrap). You need to mention your choice in the comments box while ordering the prints or you can also email us the specifications at cs@canvaschamp.co.uk after placing the order. Q: Can i make my own collection with the sizes i prefer? Q: Do you charge extra to apply black and white effect on my photo collage? A: No, there is no extra charge for a basic editing or application of basic effects. Q: What kind of pictures are suitable for wall displays? 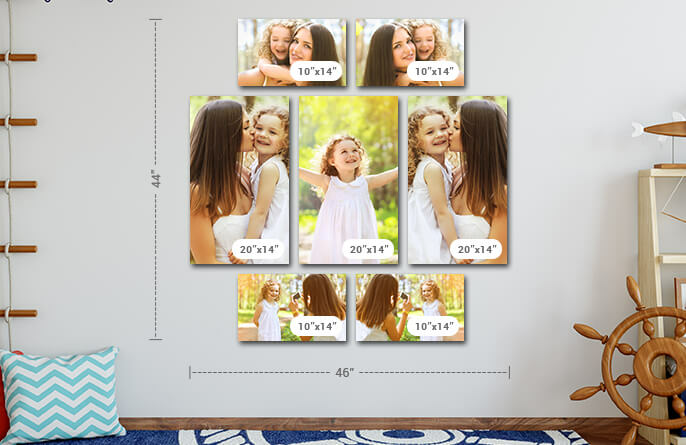 A: Any of your favorite photos can be added in the walls display prints. 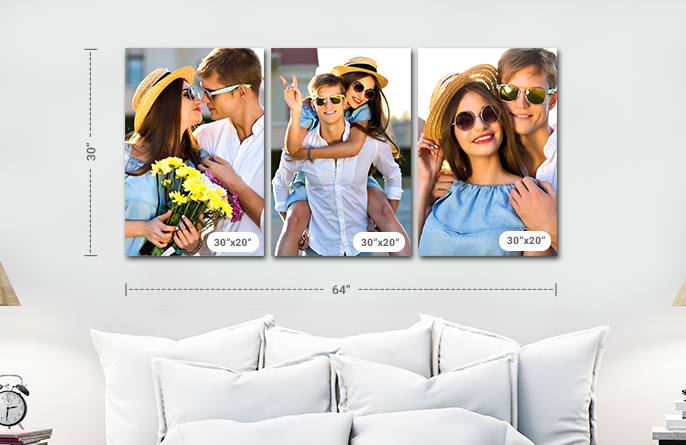 Be it a wedding ceremony or a birthday party or just a cluster of all your favorite pictures can be put up on the wall to speak about your life! Q: What is the thickness of my wall display prints? A: The thickness of all the prints in a wall display is 1.5 inches. 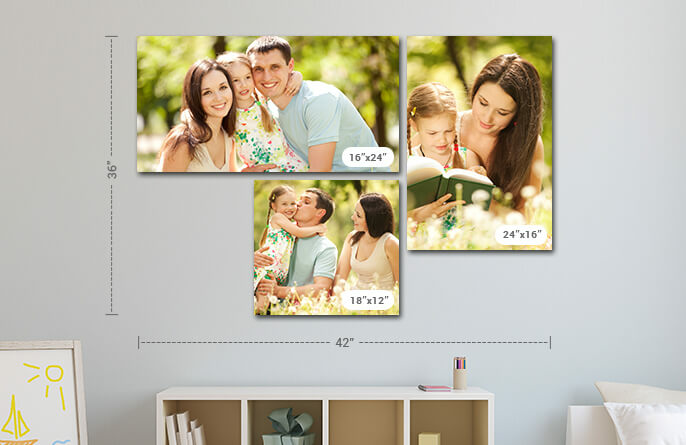 Q: What are canvas wall displays? 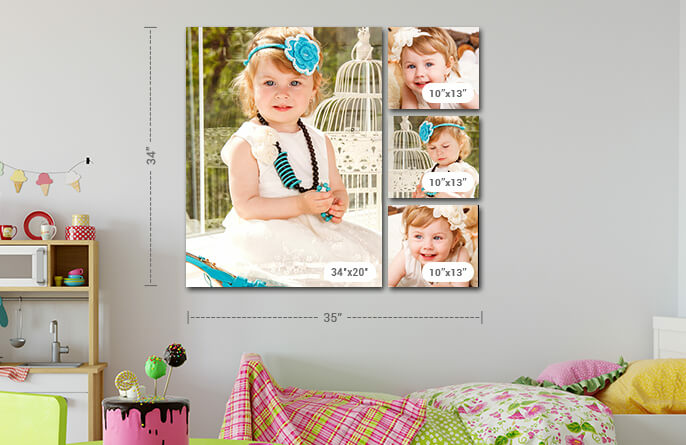 A: Wall displays are group of canvases that you can order for a special price. They are generally meant to cover the whole wall or an area of the room . You can order multiple images on multiple canvas grouping. Q: Can you do a 2/4/5 panel Canvas from a single Image ? A: Yes we can definitely do that, you just need to email your picture at cs@canvaschamp.co.uk with the desired number of panels. We will split the image according to the image proportion. 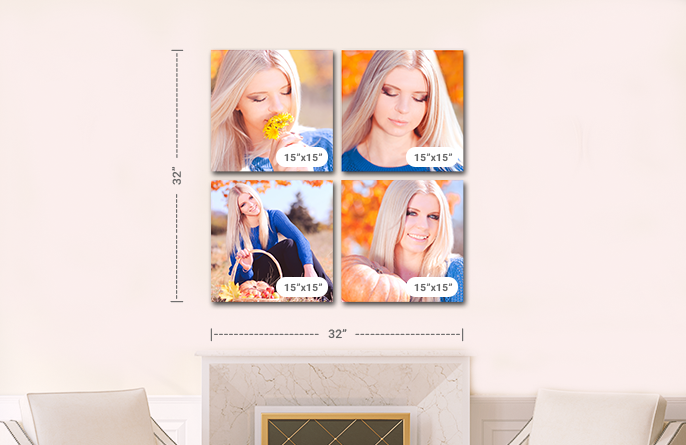 Q: How do I choose the size of my wall Display ? A: Email us the approx wall size to cs@canvaschamp.co.uk. Our designers will get back to you with the appropriate size within couple of hours.